Monday brings the chance to join Cathy’s In A Vase On Monday to share an arrangement using materials gathered from the garden. As this is going to be a very busy week with little time for flowers or the computer, I planned ahead with a simple vase of zinnias prepared on Saturday. I have grown zinnias for many years, but they are stronger and more beautiful this summer than I ever remember. 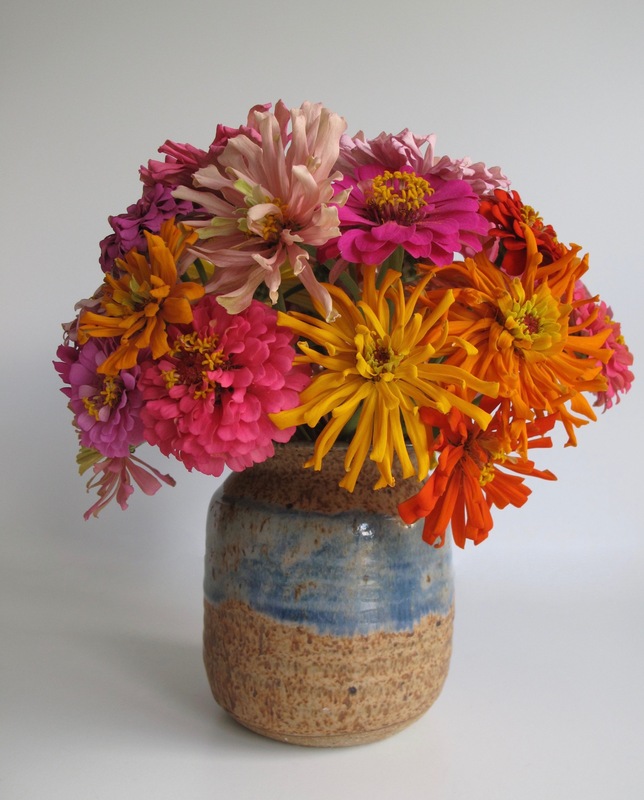 The same types of zinnias were used last week, but instead of a spare grouping of Ikebana vases, today’s is a hefty vessel embracing a fierce burst of floral colors. There is no real front to this type of bouquet but here is a look at the opposite side. There are plenty of pinks but having so many yellow and orange flowers this year makes for more eclectic combinations. Here is a close-up peek at this white flower tinged with green. This entry was posted in garden and tagged cactus zinnia, flower arranging, flower design, in a vase on monday, nature photography, summer garden, zinnia on August 15, 2016 by pbmgarden. I love that Zinnias have such different flower forms as well as a huge range of colours; you’ve proved how adaptable they are too, your arrangement last week was wonderful and so is this weeks but as you say two completely different styles. Have a lovely week, busy or not. Thanks Christina. The zinnia colors this year are better than usual with many nice subtle shades as well as the knock your socks off brights. Perfect vase to ground your colorful blooms. What are you up to this week? Hope it’s fun! Hi Marian, we were staying at Emerald Isle, NC for the week. It was glorious and I want to go back. Lovely and simple. You have convinced me to try some Cactus Zinnias this winter in my garden. I think you’ll be pleased with the cactus zinnias. They have a charm about them. We were at the beach last week Cathy and it was so wonderful. My favorite place to be. Those cactus zinnias do have a different look. I’m so glad I tried them this year. Your variety of Zinnias is fascinating, Susie, so pretty. I like the change in color as the tiny petals grow into large petals, and the cute little yellow star anthers. The cactus ones look a lot like dahlias, I will have to give them a try. Hi Hannah, hope you’re doing well. It is fascinating to see the color changes within each zinnia. 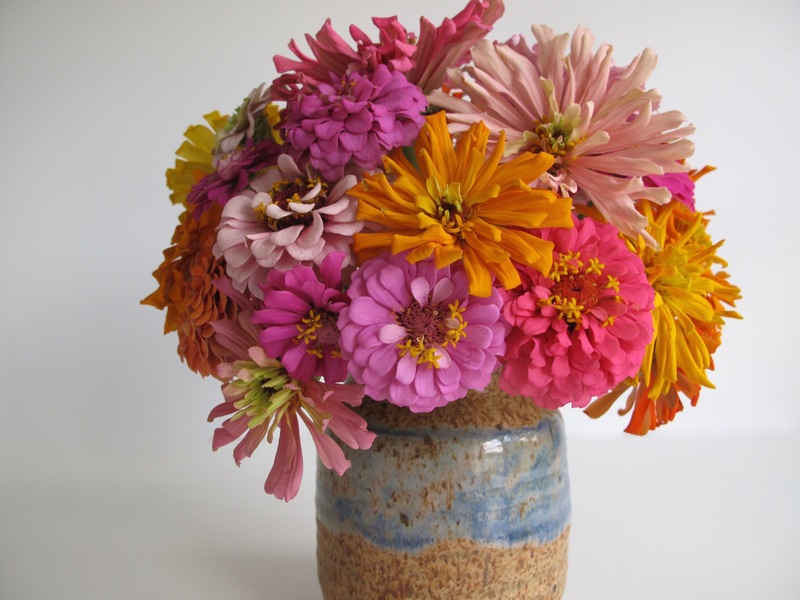 Your mix of Zinnias is glorious, Susie, and they look just right in that stoneware vase. I hope you have a great week! Hi Kris, spent a great week at the beach. Of course you’re overlooking the water all the time, but it is a rare treat for me. I find it so replenishing and rejuvenating. Hi Eliza, the cactus zinnias seem to be getting a thumb’s up from everyone. Last year none of my zinnias performed so I tried 3 different kinds this summer. It’s nice to have a mix of shapes and colors. 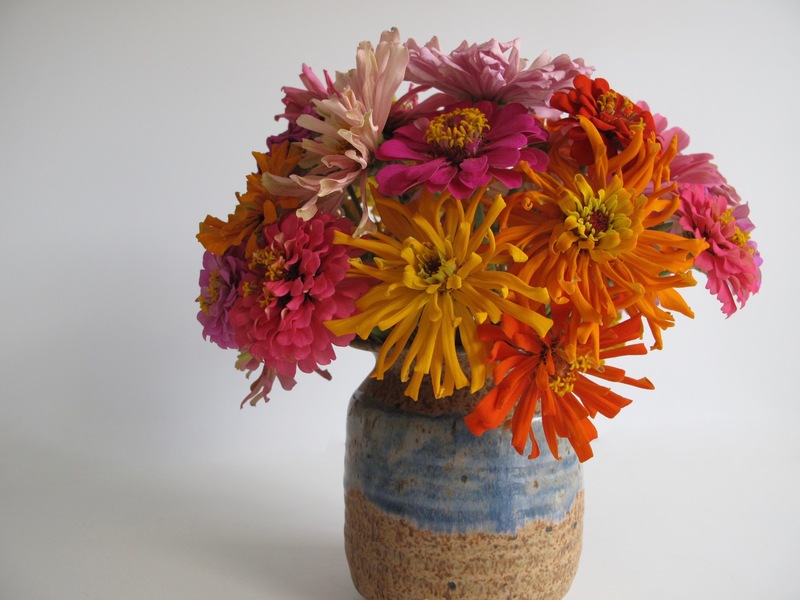 I am a little bit envious as I cannot grow zinnias, although I like them very much!The vase is perfect for your flowers. Anca, I’m surprised zinnias won’t grow for you. Is it the climate? They do like it hot, which they’re certainly getting in my summer garden. Thanks Judy. Aren’t zinnias just the best? I came home after a week at the beach and the zinnias which I’d cut before leaving home were in full bloom again. Such a gift. Oh, Zinnia…how I love thee. If only you returned my affections. Out of two packets of seeds, I got exactly three plants which are now about 4″ high. Hi Ricki, too bad about those zinnias. Hope the remaining ones will shower you with flowers. Last year it was too hot and dry even for zinnias. That was a discouraging footnote to last summer. Totally different though this year–they’re happy. Perfection in a vase. You have a fabulous combination of Zinnias! Thanks Beth. Zinnias are such happy flowers–they’re easy to love. Thanks Cathy. We are back from a wonderful week at the beach. Zinnias were looking lovely after all that neglect. That’s my kind of flower. I love those leonine orange zinnias. Are they the Z. elegans? Yes, you’re right. 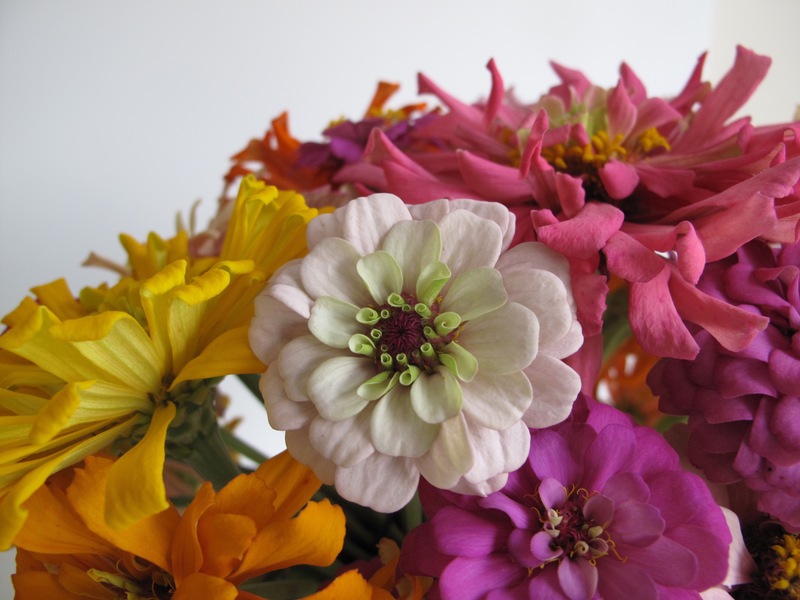 They’re Zinnia elegans ’Cactus Flower Blend’ from Botanical Interests. I do love them. Such gorgeous, luscious zinnias! Mine, this year, are just the opposite…small and not so great. Hmmm. I keep thinking it’s the heat but maybe I bought the wrong kind! To substitute I’ve been buying them at the Carrboro Market on Saturdays…. Hi Libby. Good for you for getting to market on Saturdays. Last year none of my zinnias did well so I made sure to try several kinds this year. It’s been a better season all around. Sorry yours are not rewarding. So lovely in that rustic vase. Zinnias are such flowery flowers. Well, I mean typical of the flower shape. That butterfly weed or milkweed [?] is something I bought two weeks ago. It doesn’t seem to like my garden soil much as it is already dropping buds and the butterflies ignore it completely. Oh well. There is always Buddleia, which I think you call butterfly weed. Thanks Joanna, I bought that vase at a street fair so many years ago and it’s brought so much joy. The butterflies love the zinnias. I plant asclepias (butterfly weed) every 2-3 years but it is short-lived in my garden. I think Buddleia is usually called butterfly bush. You asked after my little vase on this week’s post for the Into a Vase meme: It is indeed wood: yew, turned to perfection by a woodturning artist from Greece. I love his work and have four of his vases. They need an insert of sorts if I want to use water. He polishes them to look like glass. Thanks for the info about the vase. It is just beautiful.